Yesterday CNN provided details from five survivors of the explosion on 20 April 2010 causing the destruction of the Deepwater Horizon drilling platform and the subsequent devastation caused by the oil leak. The survivors’ account indicates that BP’s greed driven short cuts to dealing with critical problems aboard the Deepwater Horizon for over nine months; including forcing the rig’s chief mechanic to use a cost/time saving procedure he was uncomfortable with on the day of the explosion. Read it (and watch it) yourself; draw your own conclusions… but remember, CNN is not a liberal news source — and if they’re pointing fingers at big business it’s either because big business is undeniably at fault, or that’s where the ratings are (don’t underestimate the greed at CNN). Comments Off on BP Greedy? (CNN) On this day 71 years ago — December 22, 1942 — Congress got the United States out of what had turned into an unexpectedly embarrassing situation. Most people today have likely never heard of it, but the Bellamy Salute was once a constant part of the country’s life. Until 1892, there was no such thing as a Pledge of Allegiance. Daniel Sharp Ford, the owner of a magazine called Youth’s Companion, was on a crusade to put American flags in every school in the country. He sensed that the U.S. needed a boost of patriotism. Keep in mind: Not even 30 years before, the Civil War had still been raging. National unity was a fragile concept. As part of the campaign, Sharp gave an assignment to a member of his staff: Francis J. Bellamy, who was an author, a minister and an advocate of the tenets of Christian socialism. Sharp asked Bellamy to compose a Pledge of Allegiance to the flag. Bellamy wrote it, and it was published in the magazine. It didn’t take long for the Pledge to become wildly popular, even omnipresent. At schools, at campgrounds, at public gatherings, in Congress, people routinely faced the flag and pledged their allegiance to it. Because, inherently, there is something physically awkward about people simply standing in place, their arms hanging limply by their sides, staring at a flag and reciting a pledge, it was decided that devising a salute would be appropriate. Instructions for carrying out the salute were printed in the pages of Youth’s Companion. The gesture came to be called the Bellamy Salute, in honor of the Pledge’s author. The Bellamy Salute consisted of each person — man, woman or child — extending his or her right arm straight forward, angling slightly upward, fingers pointing directly ahead. For a while, the salute wasn’t especially controversial. Well, perhaps you can see the problem. Newsreels and still photos were regularly depicting rallies in Europe’s dictatorships, with thousands of people showing their fealty by extending straight-armed salutes. In the United States, the general unease about it — “the embarrassing resemblance between the ‘Heil Hitler’ salute and the salute that accompanied the Pledge of Allegiance,” in Richard Ellis’s words — was combined with the fear that scenes of Americans offering the Bellamy Salute could be used for propaganda purposes. It wouldn’t be terribly difficult to crop the American flag out of photos of U.S. citizens reciting the Pledge of Allegiance; without the flag in the shots, the photos could be mischaracterized as proof that Americans were expressing support for the ideologies of Hitler and Mussolini. And with that, it became official: Those millions of extended right arms were brought down. The stiff-armed salute was for other people, in countries far away. It was purely symbolic, of course, but symbols are powerful. Over the years, there have been various disputes about the Pledge of Allegiance, the most basic of which is the question of whether citizens should even be expected to publicly pledge their allegiance to their country. The United States was founded on ideals of freedom, and freedom includes not being forced, or cajoled by peer pressure, into publicly declaring any belief. The exact wording of the Pledge has changed several times since Francis Bellamy wrote it; each change was reflective of contemporaneous concerns about the meaning. For example: “I pledge allegiance to the flag” was originally “I pledge allegiance to my flag.” The “my” was dropped out of worries that recent arrivals from other nations might be seen as pledging their loyalty to the flag of the country of their birth. 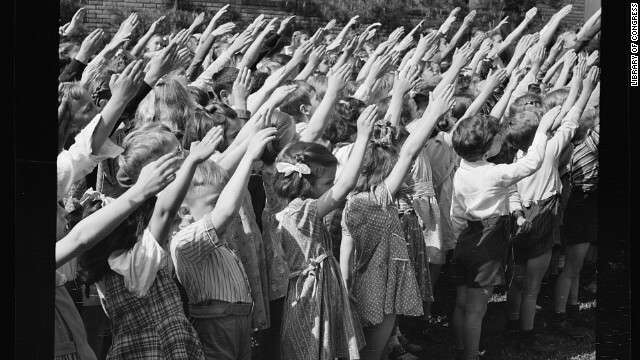 The wording of the Pledge of Allegiance may or may not be changed again in centuries to come, but it’s a pretty safe bet that the Bellamy Salute is never coming back. Once ubiquitous and unquestioned, it has become a faded and mostly forgotten bit of U.S. history. Yesterday a report was released by the US Department of the Interior’s inspector general indicating that inspectors with the Minerals Management Service (the agency charged with inspection and regulation of oil drilling and mining operations; the leasing of offshore parcels for drilling and mining; safety and environmental monitoring of drilling and mining safety; and the collection of royalties from oil and gas companies) routinely accepted gifts from the companies they were responsible for policing. The report covers the Lake Charles Louisiana district of the Minerals Management Service for a period ending in 2008; which is not the same as the are in which the Deepwater Horizon drilling rig which exploded on 20 April 2010 is in. The report included details of the routine acceptance of gifts comprised of hunting trips, college football tickets, and meals and adds to the growing portrait of the Minerals Management Service as part of a corrupt industry — in fact inspectors in the Minerals Management Service were often friends of officials in the industry, former employees (and sometime retirees) of the oil and gas industry before the assumed responsibility in the federal government for regulating those businesses. Government employees are not allowed to accept gifts from companies they do business with — and certainly the appearance of accepting gifts for a company that you are intended to regulate is suspect to say the least. While there’s no direct evidence that such negligence by federal employees contributed to the oil disaster in the Gulf of Mexico; there would be no way to assure the general public that minor (and perhaps major) infractions were not overlooked by regulators who didn’t want to risk upsetting the status quo and losing their gravy train. Certainly we can ask our federal elected officials to explain to us how something like this could happen. After all, most of them take large contributions, favors, and gifts from individuals and businesses who want to sway their votes. Yesterday the Supreme Court of the United States of America ruled against the Nation Football League in a case concerning the NFL’s decision to give Reebok the exclusive merchandising license for all thirty-two NFL teams. The case was filed against the NFL by Bob and Ron Kronenberger — the owners of American Needle, founded in 1918 by their grandfather who originally approached the Chicago Cubs in 1946 with the idea of selling fan caps similar to those worn by the players. The first lot sold out in one day; the second in less time — and a (highly profitable) tradition of selling logo’d sports items for professional teams was born. The Supreme Court ruling isn’t entirely clear on the scope of the anti-trust actions the NFL engaged in, but chief justice Stevens likened the NFL to a cartel. The case was sent back to lower courts to resolve several issues. I guess the fact that a price jump of $19 to $30 for a cap didn’t help the NFL’s case in arguing that no harm was done to the public by monopolizing the licensing. The courts ruling, and subsequent lower court rulings (which may involve jury rulings) will undoubtedly reshape the landscape of all professional sports licensing — hopefully benefiting the consumer, and curbing the greed and lavish profits. I’ve put them in descending order of number of customers (which should be accurate after the acquisition of regional carrier AllTel Communications by Verizon Wireless). Basically there are two protocols used in the United States at the moment: CDMA (Verizon and Sprint) and GSM (AT&T and T-Mobile). And each has their own data formats associated with them. Most of the rest of the world uses GSM, though there are a few other areas that use CDMA (there’s no standard frequency for the use of GSM or CDMA world wide). Verizon has one of the most complete 3G networks today; but other carriers have 3G deployed in most urban areas as well. But when Verizon wireless won the bulk of the C-Block allocations in open auction last year the wheels set in motion for major change. Shortly after winning those C-Block allocations, Verizon announced that it would use LTE (Long Term Evolution), a 4G standard defined by 3GPP and backed by GSM. Hold the phone — Verizon is essentially dropping CDMA on their C-Block allocations in favor of LTE; and the LTE standard defines LTE use on ALL the frequency bands used world wide… will Verizon convert over it’s existing spectrum to LTE; will all carriers follow suit and migrate to LTE? Just when you thought you had the cellular market figured out, things change. Of course, it will be around two years before we see LTE in use on those C-Block allocations by Verizon; and I’m guessing closer to three years before they really have coverage — so maybe a dual mode Verizon phone for CDMA/LTE for the interim? Who knows… and who really cares! All anyone wants is less expensive service, more freedom to choose handsets, and reliable connections! Maybe those things will come with LTE as well (don’t hold your breath — just because open access is supposed to be part of the C-Block spectrum, cellular carriers have come up with lots of clever ways in the past to skirt the law). Yesterday a copyright infringement trial begain in Stockhome Sweden… at the center of the trial is Fredrik Neij, Gottfrid Svartholm Warg and Peter Sunde Kolmisoppi who have often voiced their disdain for copyright laws; and Carl Lundström who largely funded the venture. You know these four more familiarly through their online identity, The Pirate Bay. The focus of the prosecution’s case is that these individuals enabled others to share copyrighted property (IP), could have placed controls on the sharing of IP, and actually profited from the operation of the site that provided a directory of illegally shared IP. The four’s defense is that they did not in fact share any IP, that they merely operated a site that provided “free speech” to individuals who wanted to post information there. This is a very similar tactic used in the Napster, Grokster, and Kazaa litigation; but interestingly enough previous attempt to close The Pirate Bay have failed. There are a number of key points that are going to be covered in this trial; one of which will likely be the EU privacy laws; the second is the commercial aspect of The Pirate Bay (they made lots of money, way more than it took to operate the business). An interesting point in all of this is that the advertisers that supported The Pirate Bay have not been implicated in this case. One would assume that they had as much knowledge of what was going on on the site as the owners. The prosecution has been careful to avoid bringing file sharing into the case; in fact in their opening arguments they made it clear that they were not attempting to prevent file sharing as a whole, merely to protect the intellectual property of their clients. Watch this case carefully, it will effect mostly what happens in Europe; but a win for the recording industry there will likely be seen as carte blanche to push forward with their efforts to have ISPs monitor what you and I do online without reguard to legalities. In the US Thanksgiving as a harvest festival in North America dates back to September 8, 1565 in what is now Saint Augustine Florida, not the “politically convenient” Thanksgiving for Christians that’s part of the American myth and historical lie propagated by education in the US (and you just thought it was the Russian view of history that was twisted to suit their political agenda).